Approximately one-third of older adults between the ages of 65 and 75 suffer from hearing loss. At age 75 and above, about 50 percent of seniors have hearing loss. Because it often happens gradually over time, sometimes older adults don’t even realize they don’t hear well. They get used to the hearing changes and may believe they hear just as well as they did when they were younger. It’s possible that you may not notice the changes in your aging parent either. Below are 5 signs to look for that can help you determine if your aging parent might be dealing with hearing loss. Does your aging parent ask you to make phone calls for them? Do they neglect to answer the phone when it rings or wave away offers to talk to someone on the phone? If so, it may be because they have difficulty hearing what people are saying over the phone. As hearing worsens, your parent may keep turning the volume up on the television to hear what is being said. Because television programs use a variety of sounds all at once, like background music, sound effects, and dialogue, it can be hard for older adults to pick out just one part of it. They may not realize the television is so loud, but it might be giving you a headache! The ability to hear higher pitched sounds can be one of the first things to go in a senior’s hearing. If your parent has trouble hearing the voices of young children, it can be an early sign of hearing loss. Seniors with hearing loss may not chime in on conversations because they cannot hear what is being said. They may fear they will embarrass themselves by saying the wrong thing or misunderstanding what someone says. If your aging relative shows signs of hearing loss, they should see a doctor or hearing specialist. Getting hearing aids will allow them to continue enjoying conversations with family and friends, which improves their quality of life. Home care can assist older adults in getting hearing aids by driving them to appointments to have their hearing tested and hearing aids fitted. 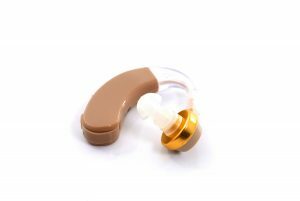 Home care providers can also help your parent to take care of their hearing aids. Home care providers can help to keep them clean and change the batteries when needed.